TEMPORARY PICTURES FROM THE OWNER, the new ones are coming soon! Totally renovated cozy studio apartment in Milan, on the 3rd floor without elevator of an ancient renovated building in perfect conditions. Living room with a sofa double bed, table and TV. Separated modern fully equipped kitchen. A lot of storage room, thanks to the large wardrobe and closets. Beautiful up-to-date bathroom with a large shower and washing machine. The apartment is bright and quiet, facing the inner courtyard. Unlimited wifi internet connection and air conditioning. 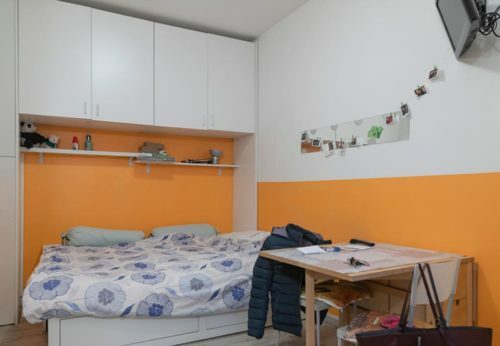 Perfectly located, in a safe residential area, close to the center and Porta Ticinese, between Bocconi University and Navigli area. Close to the main public transports, nearby you can find every kind of shops and service. Restaurants, bars, art galleries, gym. Walking distance from the city center. Near Porta Genova metro/train station. Perfect to easily reach the main Universities: NABA, Bocconi, IULM, SPD, Cattolica.